Ryan has a long history of supporting more cheap labor immigraiton, despite the harmful impact on Americans wage earner, in workers’ productivity, and on the GOP’s political support. 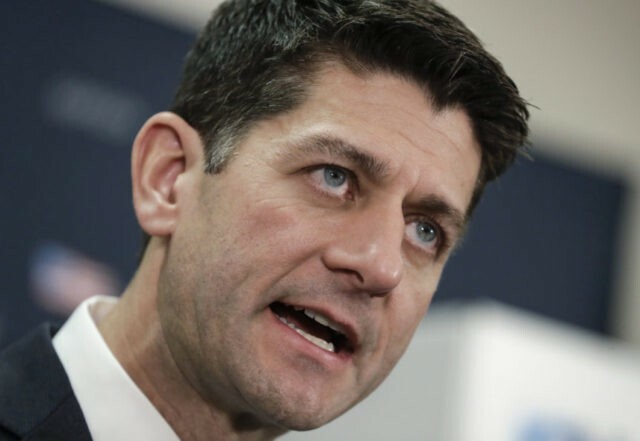 Ryan did not run for reelection in 2018 and is expected to take a well-paid job from GOP-aligned business groups in the new year as his former majority faces a Democratic majority in the House. His deputy, California Rep. Kevin McCarthy, is expected to adopt a more populist stance as minority leader in the House. The Goodlatte bill would have cut legal immigration by ending the visa lottery, providing a work permit amnesty to just the 700,000 illegals who are registered in the DACA program, and ensuring deeper immigration cuts, said Rosemary Jenks, policy director of NumbersUSA. It also included much careful language to hinder fraud and to prevent pro-migration judges from hijacking the bill’s limited amnesty for their own goals, said Jenks, who opposed the bigger Ryan bill. But Ryan’s two-vote strategy successfully blocked the Trump-backed Goodlatte reform bill. In February, the Senate’s GOP leader, Sen. Mitch McConnell, used a Ryan-like strategy to block Trump’s “Four Pillars” reforms. McConnell scheduled a debate where legislators were allowed to vote on four rival immigration bills. This complex vote allowing a bloc of roughly 15 business-first Senators to disguise their votes against Trump’s reform by voting against amnesties pushed by Democrats. McConnell’s four-vote maneuver also allowed business-first GOP Senators and Democratic “moderates” to vote for a dramatic double-amnesty bill developed by several Republicans — including Maine Sen. Susan Collins and South Dakota Sen. Mike Rounds — with several Democratic Senators. The double-amnesty was pitched by business groups and by the establishment media as a moderate middle-ground compromise, even though it would have directed enforcement officials to stop deporting illegals who are holding down Americans wages by covertly working for Americans employers. If McConnell had only allowed a single vote on Trump’s reforms, the GOP and Democratic Senators would have had to publicly display their support or opposition to Trump’s pro-American reforms. The policy also drives up real estate prices, widens wealth gaps, reduces high tech investment, increases state and local tax burdens, hurts kids’ schools and college education, pushes Americans away from high tech careers, and sidelines at least five million marginalized Americans and their families, including many who are now struggling with fentanyl addictions. Immigration also pulls investment and wealth away from heartland states, because coastal investors can more easily hire and supervise the large immigrant populations who prefer to live in the coastal states.